How many of us have sat at our desk at work, counting down the minutes until it’s time for lunch and our staple option that is bland, expensive, unhealthy or just too similar to what we had yesterday - and the day before? The author, David Bez, is not a chef. He is a food lover with a limited lunch break; an Italian who cares about what’s on his plate; a designer who knows that you eat with your eyes first. For the past three years, he has made himself a salad for lunch every day at work, with fresh ingredients, minimum preparation time, and maximum flavour. Day after day, his colleagues peer over his shoulder to watch him craft yet another beautiful salad perfectly balanced in its composition and bound to both satisfy him and energize him for the afternoon ahead. 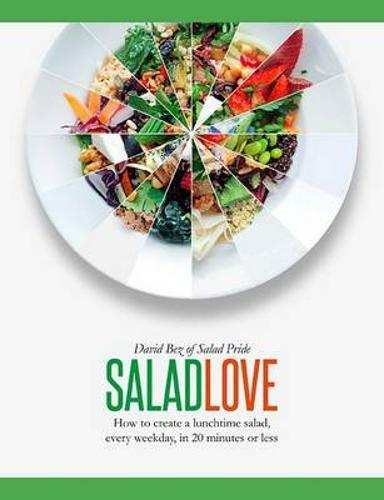 He has developed a winning formula for creating salads by layering a base, vegetables or fruit, fresh herbs, protein toppings and dressings, which creates a perfect salad every time. Clearly marked with a vegetarian, vegan, raw, omnivore or pescatarian designation, every salad is an inspiration and can be adapted to suit a different diet. Fresh, tinned, jarred and pre-cooked ingredients are all explored; seasonality is key and variety keeps things nutritious and exciting.